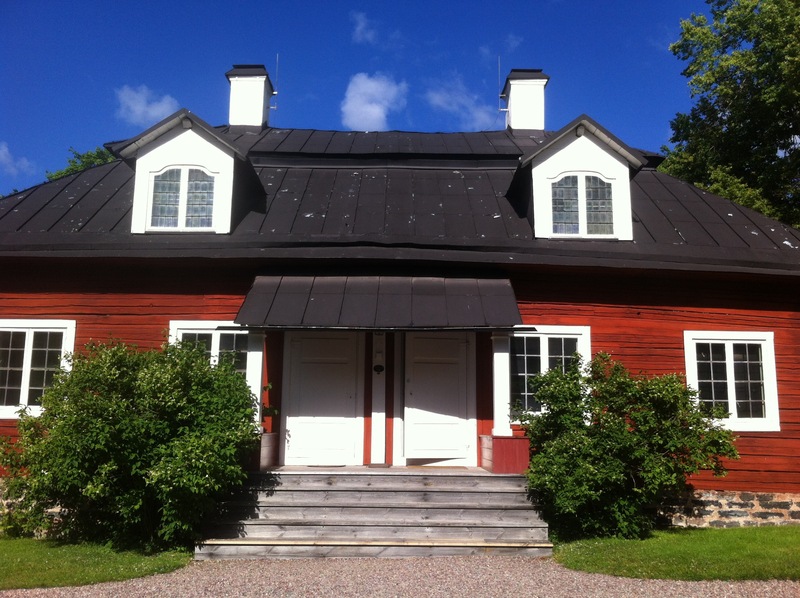 Fay Edwards is currently studying for the Prince’s Foundations MA in Sustainable Urbanism, follow her as she embarks upon the INTBAU European Summer School in Classical Architecture in Engelsberg, Sweden. You can find out more about the summer school here. 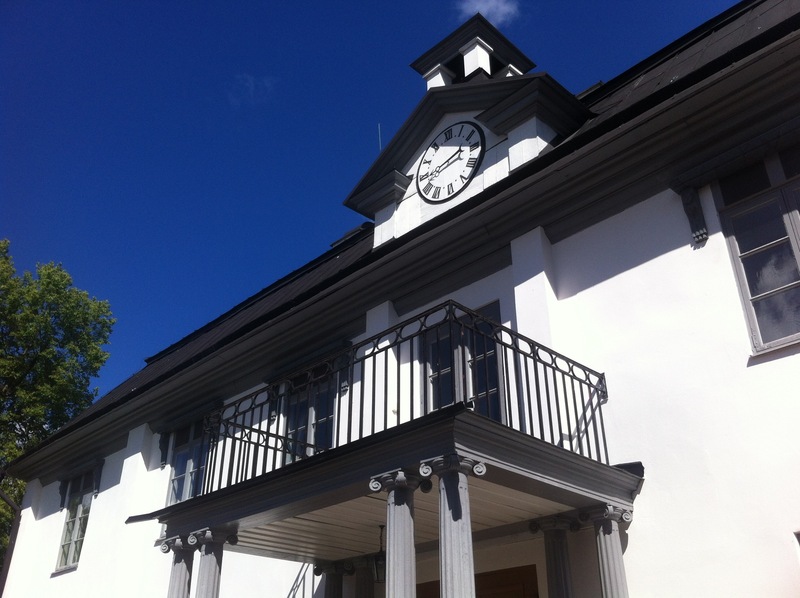 As the first year of my MA in Sustainable Urbanism at the Prince’s Foundation draws to a close, it’s time to look towards the summer holidays…and incredibly, I will have the privilege of attending a European Summer School in Classical Architecture in Engelsberg, Sweden. So whilst summer in London is a delight, I can’t wait to experience the Swedish summer – learning about classical architecture with some of the most respected academics and practitioners in the field. Run by INTBAU Sweden and the Ax:son Johnson Foundation, this course will teach the foundations of Classical Architecture – from theoretical lectures on architectural orders and composition, to practical lessons in measured and freehand drawing, as well as hand-drawn architectural draftsmanship and computer aided design. Design projects, daytime excursions and evening lectures will compliment what I expect to be an incredible month. Pulling up at Engelbergs Bruk in Sweden was a welcome relief from my long trip from London. We were here for the very first European Classical Architecture tour, run by INTBAU and the Ax:xon Johnson Foundation. Where were we? Engelsbergs Bruk, which is an old ironworks built in 1681 that has recently been converted to a beautiful venue for conferences and special events. 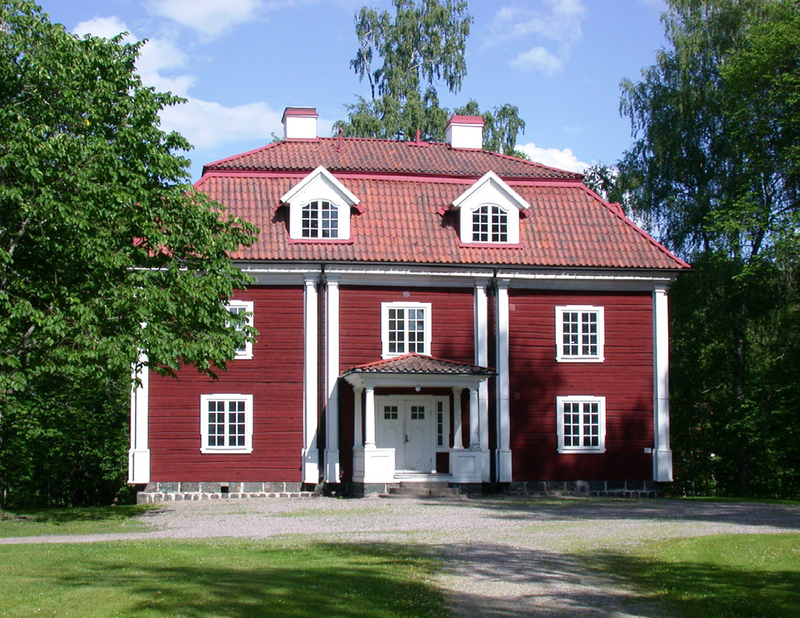 Set amongst the Swedish forest, the main converted factory building is surrounded by archetypal Swedish red cottages used for student accommodation. Carefully appointed with original paintings and furniture, these cottages made us feel very much at home. After a quiet Sunday evening to prepare for the week ahead, we were quickly thrown into our lessons. Beginning with a tour of the grounds, we ended our first day with a tour of the estate archives, which included kilometres of shelf space dedicated to architectural drawings dating from the 17th century. By Tuesday we began drawing lessons, taught by the incredibly enthusiastic Anna. We started with with gestural drawing using a variety of techniques…not to mention the preparatory jog around the studio to increase our creative energy (a theory of Anna’s). After a scrumptious ‘fika’ (a routine we happily adopted), we made a quick trip to the shops before an evening lecture by Robert Adam. His lecture focused on the Unity and Variety of Classical Architecture, and was a great introduction to the theory that we would cover in the course. There was certainly no time for getting bored, because Wednesday was our most exhausting day yet! Anna had organised a live model to visit, so we spent the day being led through a number of techniques for Life Drawing. By the end of the day we could barely walk down the stairs from our studio….but thanks to an interesting lecture by Robert Adams on the Classical Orders, we made it through to dinner without collapsing. As Thursday morning arrived we were welcomed by a gentle start. George Saumarez Smith had arrived to spend the morning teaching us about techniques of measured drawing. 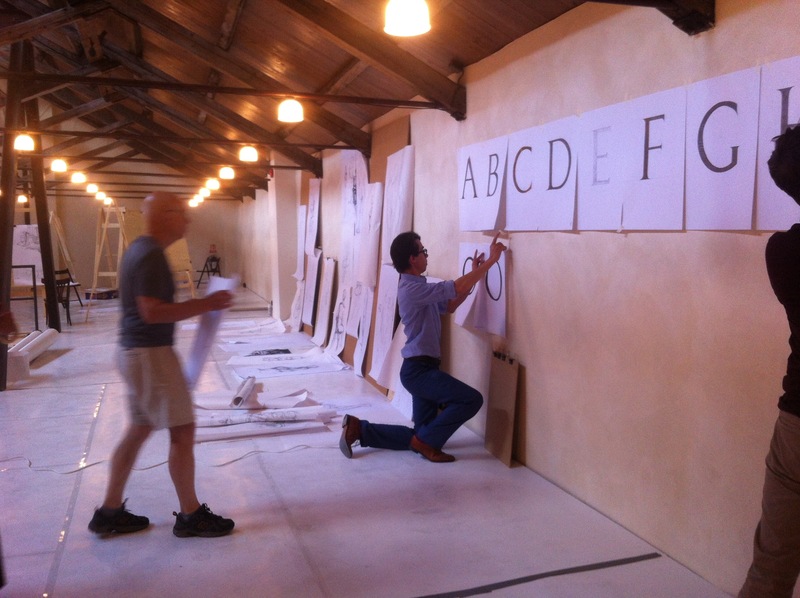 After lunch, groups were assigned a site to do a measured drawing for the remainder of the day. We couldn’t have asked for a more delightful way to spend the summer afternoon. Before we knew it, Friday had arrived. Another gentle day followed – focused on shadow casting and lettering. Whereas shadow casting challenged us to observe the play of light upon a capital, lettering appealed to the perfectionists among us. Following instructions first penned by Pachomius, we each drew a letter of the alphabet. The final day of our first teaching week ended with a trip to the town of Falun. Home to a huge mine dating from the 10th century, this village boasted perfect traditional red cottages, as well as an impressive church. With big clouds gathering on the horizon, we each quickly chose a spot to spend the day sketching. By the time the clouds finally broke, we were happily on the bus back to Engelsbergs Bruk for a lovely dinner at a local restaurant, where we bubbled and chattered as the sun set over the lake outside our window. As we are reaching the end of the third week here in Engelsbergs Bruk, we have made the transition from freehand drawing to more technical architectural drafting. From lectures in specific Classical canons by Hugh Petter, to lectures in technical drawings for commercial construction by Peter Drijver and Mieke Bosse, this component of the course has focused our attention on the important technicalities of turning visions into reality. Whilst our second week introduced us to urban design and planning, our third week has been focused on individual designs for a square in the local town of Vasteras. Each team has three buildings to design: one mixed use, one civic, and one commercial. After a day spent analysing the town square through observation and measured drawing, we are all trying to pull together a building that is both classical and vernacular. And after three days in the studio, things are starting to take shape. The next three days will be dedicated to refining our designs and making presentation drawings – ready for final submission on Sunday. And whilst the next few days promise to be stressful, we have a visit to Carl Larsson’s house on Monday to look forward to, which will be followed by the next stage of our course – a week in Stockholm. After three weeks at the beautiful Engelsbergs Bruk, it was time for us to make our way to Stockholm for the final week of our summer school. Here we would get to see some of the most well known examples of the ‘Swedish Grace’ period, as well as to experience the way in which Swedish Grace influenced urban design and planning. 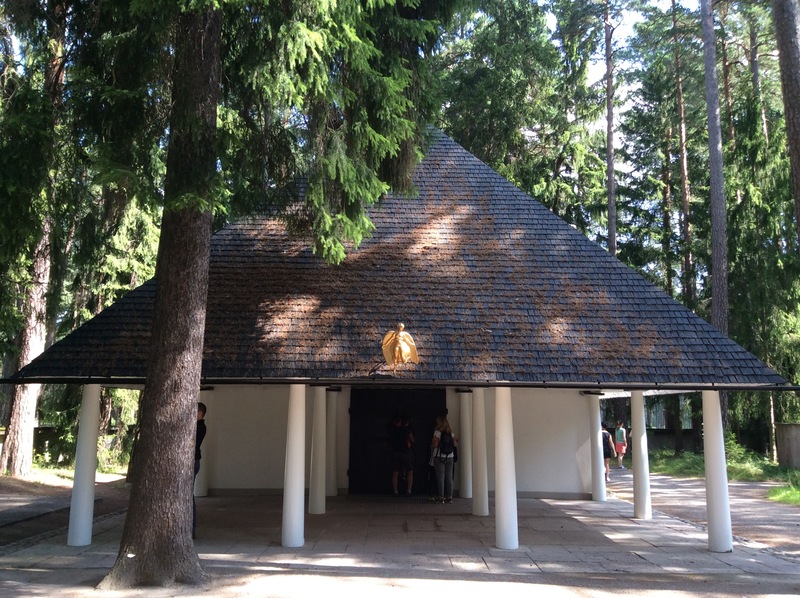 To begin this part of the school we were taken to the Woodland Cemetery just outside Stockholm. We were met with vast grounds and silent trees – through which we wandered to find the Woodland Chapel by Gunner Asplund and The Chapel of Resurrection by Sigurd Lewerentz. These two very different buildings exemplified the diversity of Swedish Grace, but managed to typify it with incredible use of light, space, and classical features. The following day we were given a tour of Swedish Grace in Stockholm by Johan Martelius – renowned architectural historian and co-author of ‘Swedish Grace – The Forgotten Modern’. 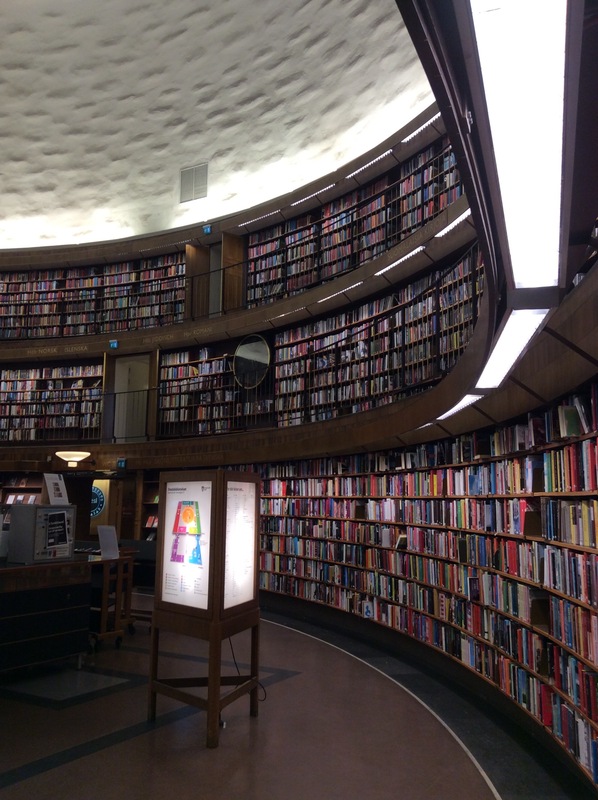 Between intermittent showers of rain, Johan led us through the Stockholm Concert Hall by Ivar Tengbom, the Stockholm City Library by Gunnar Asplund, and the ‘Red Hill’ District. From the gorgeously extravagant blue exterior of the City Hall, to the luminous interior of the City Library, it was striking to see how cohesively and confidently these buildings harnessed past traditions and new ideas. Helene Littke led us on another tour of Stockholm the next day, and this time we were to stop at the Stockholm City Hall by Ragnar Ostberg, and the Gamlastan District – Stockholm’s Old Town. In Gamlastan we were given a sneak peak of one the oldest residential courtyards in the area, before being eased back into ‘real work’ with an afternoon dedicated to beginning a measured drawing of a door case of our choosing. To close the day we made our way to the studio for a lecture by Johan Martelius. 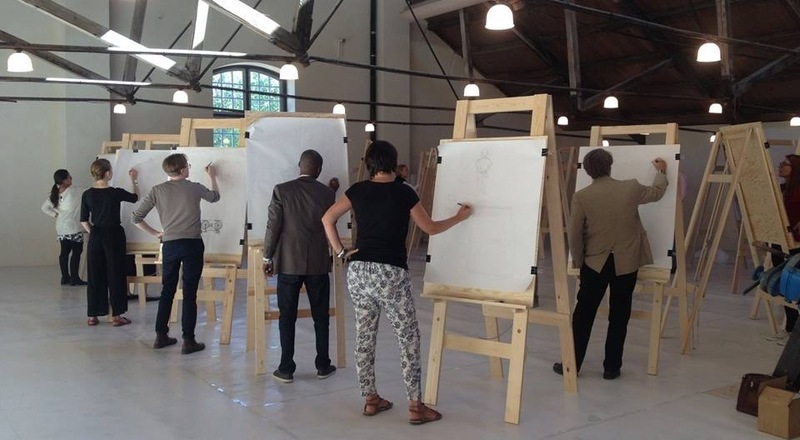 The next day was dedicated to refining our measured drawing, ready to be presented to Bob Adam, Jenny Bevan, Christine Franck and Christopher Liberatos, as well as participants of ‘Architects Uprising’ and the general public. 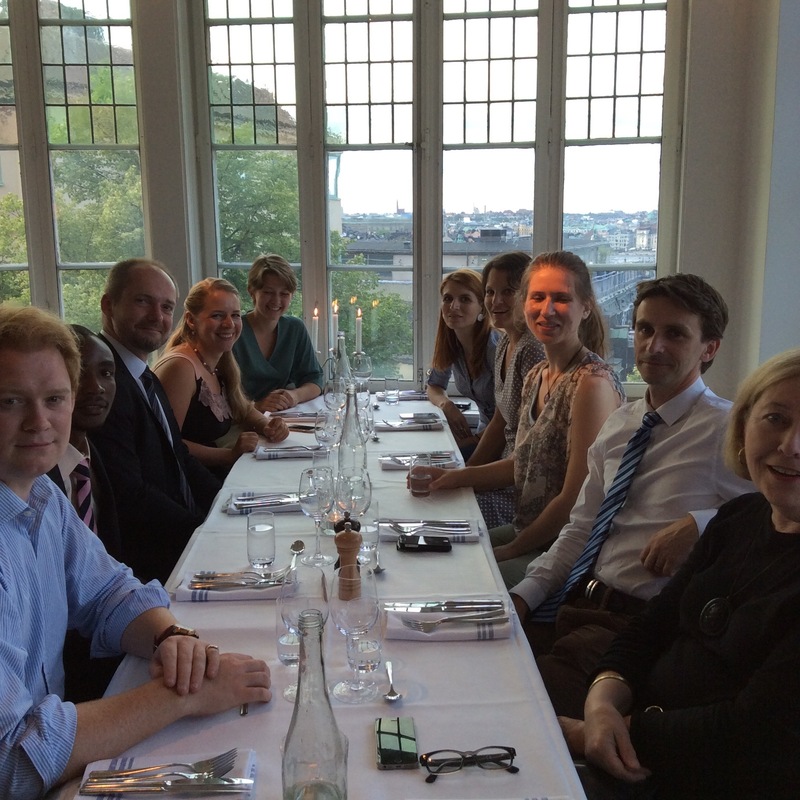 After a final review it was time to pack up our t-squares and pencils and head to our farewell dinner overlooking Stockholm. If the amount of toasts made throughout the evening were any indication, it would be safe to assume that the very first ‘European Summer School of Classical Architecture’ was an incredible success. On behalf of all the participants, I would like to thank everyone who worked so hard to make this summer school happen. To Helene Littke, Christopher Liberatos and Jenny Bevan – thank you so much for sticking with us for the entire month. To the Ax:son Johnson Foundation, thank you for your generosity and for the beautiful venue. To Bob Adam, Harriet Wennberg and Lauren Banks from INTBAU, thank you for your dedication and organisational support. Many thanks also go to the staff who worked so hard at Engelbergs Bruk to keep us well fed. And finally, to all of the wonderful lecturers who made this summer school the inspiring, stimulating experience that it was – it would not have been such a success without your enthusiasm, expertise and humility. INTBAU would like to thank Fay Edwards for taking the time to write this fantastic blog whilst on the European Summer School 2016. If you would like to take part in the next European Summer School in 2017 please email us at info@intbau.org to express your interest.